Today I found out what causes the Northern and Southern Lights (aurora borealis and aurora australis respectively). Simply put, these lights are caused by very fast moving electrons striking atoms in the Earth’s upper atmosphere, primarily oxygen and nitrogen atoms which make up most of our atmosphere. When this happens, it can put these atoms in an excited state. During the process with which they return to their normal state, they emit this excess energy in the form of visible photons. So where do these fast moving electrons come from? Charged particles from the sun’s corona are constantly striking near the Earth and are more or less deflected by the Earth’s magnetic field, which in turn protects life on the Earth from being harmed by these solar winds. When these charged particles encounter the Earth’s magnetic field, they end up traveling along the field lines with some of them ending up interacting with the magnetic field lines, cutting across the field, thus producing a current which can accumulate to upwards of 10 million megawatts! This current ends up creating a fairly unstable state in the magnetosphere. Occasionally, some of this current is discharged causing electrons in the magnetosphere to spiral down towards the poles and through the Earth’s upper atmosphere. As it descends into the atmosphere, it collides with primarily oxygen and nitrogen. When this happens, the atoms move to high energy orbitals. This state is fairly unstable for these atoms and they will return fairly quickly to their normal orbitals. To do so, they must release the excess energy they have stored up from this collision by emitting a photon. With enough of these atoms going from the high orbital state to the low orbital state, it will produce enough light to be viewable to the naked eye by people standing in appropriate locations on Earth. The most common aurora is a green-ish / yellow color. This is produced by oxygen atoms that are around 60 miles high. A blue aurora is produced by ionized nitrogen atoms. 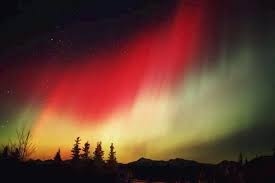 A red aurora is produced by high altitude oxygen atoms, as high as 200 miles, being struck. A red color can also come from neutrally charge nitrogen atoms being struck; this will typically appear with a purple color as well, making a nice purple/red aurora. Occasionally, auroras have been observed as far south as Florida. However, in general the best places to observe this phenomenon are in Canada, Alaska, Greenland, Northern Russia, and Northern Scandinavia. 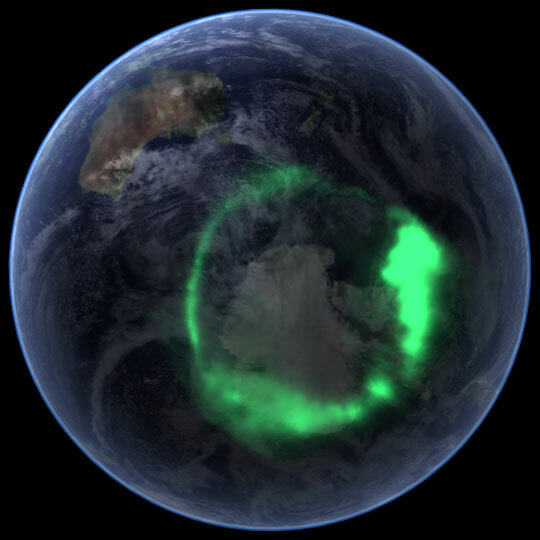 For the southern auroras, these are concentrated in a ring around Antarctica and the southern part of the Indian Ocean, none of which tends to offer very habitable viewing points unless you are at certain research stations in Antarctica. They can sometimes be observed in parts of Australia and South America as well. Not surprisingly, given the nature of what causes the auroras, it has been observed that the northern and southern auroras very closely mirror each other at any given moment. The “australis” in aurora australis comes from the Latin for “of the South”. While many have claimed that they can hear the aurora, this is thought to be impossible due to the fact that the air where this electrical activity is occurring is much too thin to conduct sound. Further, scientists have to date been unable to detect any sound from the auroras. The auroras take place between about 60 and 200 miles from the surface of the Earth. Auroras don’t just occur on Earth. Any planet with a magnetic field and atmosphere that experiences these solar winds will have an aurora, such as Jupiter, Neptune, Uranus, and Saturn. Interestingly, they’ve even been observed on Venus and Mars, even though Venus has no planetary magnetic field and Mars has a very weak one. Boston Operator: Please cut off your battery entirely for fifteen minutes. Portland Operator: Will do so. It is now disconnected. Boston Operator: Mine is disconnected, and we are working with the auroral current. How do you receive my writing? Portland Operator: Better than with our batteries on. Current comes and goes gradually. Boston Operator: My current is very strong at times, and we can work better without the batteries, as the aurora seems to neutralize and augment our batteries alternately, making current too strong at times for our relay magnets. Suppose we work without batteries while we are affected by this trouble. Portland Operator: Very well. Shall I go ahead with business? Boston Operator: Yes. Go ahead. 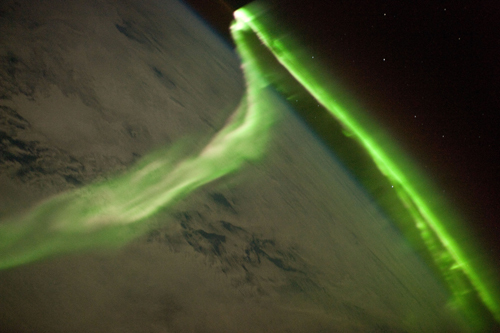 What Causes Northern and Southern Lights? They are wrong about the color origin.The earth being a magnet attracts such things as electrons are drawn in by the magnetism, photons however are not so attracted and they strike the incoming electrons at a perpendicular angle and in fact pass through them causing a condition known as magnetic re-connection. This magnetic re-connection is the “fall” that creates elecricity and such anomalies as the “Birkeland and equatorial currents”. These electrically generated fields enhance the magnetic field and set up the Van Allen shields.. electromagnetic shells .. The angle at which the electrons are hit, is much like sunlight and rain. rainbow effect with a “shimerance”. How have our bright minds overlooked this. ?